The 2 Seas area (the English Channel and the North Sea) has a rich marine history, with a wealth of ships and boats steeped in nautical heritage and character. The traditions and skills of this maritime industry is an important asset which is highly valued by those living in the regions along the coastline of the UK, Netherlands and Belgium. It is both a key part of these regions’ history and economy, as well as an important cultural attraction for visitors. However, across the regions the preservation of this sailing heritage is under threat. 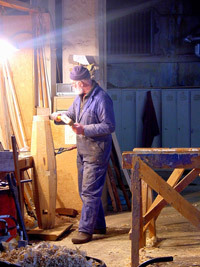 The skills unique to wooden boat building are known to a small and decreasing number of experts, who are of progressing age. If no action is taken, it is only a matter of time before these skills become extinct. The traditional maritime skills project in Cornwall has been following a number of projects. There was an opportunity to record the building of the first Mayflower by Marcus Lewis of Fowey. Originally built by Skentlebery in Plymouth using moulds and patterns, sadly these were lost to fire and no plans had ever been drawn for the dinghy. Skentlebery managed to built 100 of these boats so this one will be 101st dinghy to be built and the first for Marcus. The Mayflower is a 14′ clinker dinghy with a gunter rigged, and a steel centreplate. 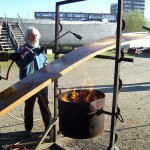 To find out more about the Mayflower and Marcus, visit his website ~ www.woodenboatbuilder.co.uk. 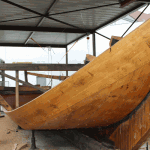 Traditional Maritime Skills project sets out to capture the skills unique in wooden boat building. The building of the Grayhound which is being led by experienced boat builder Chris Rees with a small team of local shipwrights is a 62 foot scale replicate of the 1776 3 masted lugger. The short film covers the building of the Grayhound at Southdown near Millbrook, Cornwall. In the coastal parts of the 2 Seas area, boat building and associated marine industries are an economic sector that demonstrates strong growth potential. However, in all regions companies are finding it difficult to recruit highly skilled workers mastering specific boat skills. The danger is that these skills will become extinct. The Traditional Maritime Skills project targets these threats to marine development in one go. The cross-border cooperation creates a commitment by all partners to preserving traditional boat building skills in the four countries of the 2 Seas area for the long-term. They will collect and record these skills, promote their use in traditional and modern boat building and increase the number of people pursuing education and a career in boat building. The partners will jointly record traditional boat building skills from the remaining experts working in boat yards in all four countries. They will use standard skills description and methodology to ensure the collated results can be widely shared. Individuals and businesses working in the industry, and in turn their regions’ economies.